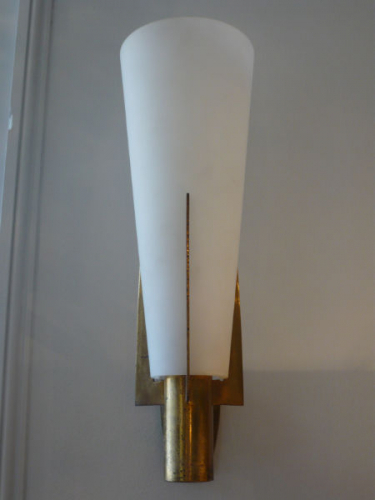 Fantastic pair of Stilnovo wall appliques, gilt metal and curved opaque glass conical shades. Italian c1950. Stamped and Stilnovo transfer. Original condition, pair of Stilnovo wall appliques bearing the Stilnovo stamp and transfer to the gilt metal brackets. Opaque glass shades. An Italian classic. c 1950. Rewired and certified for UK use. An impressive pair subtle for many interiors.